meghan eats local: I Can Has Burger Substitute? I never used to eat hamburgers (or cheeseburgers) when I was an omnivore, so it wasn't like I really had to give them up to become a veghan. 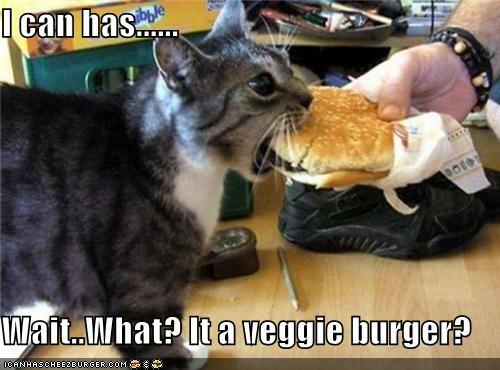 But now that I can't eat them, I've become interested in burger substitutes. In my omnivorous past, the only poser burger I had tried was a Boca Burger. My mom sometimes made Boca Burgers for dinner when I was in high school and I always felt indifferent about them. They weren't gross, but on a scale from 1 (unsalted saltines on cardboard) to 10 (a fancy 30 Minute Vegan meal I lack the skills to prepare), they were only about a 4 or a 5. So I haven't purchased them. 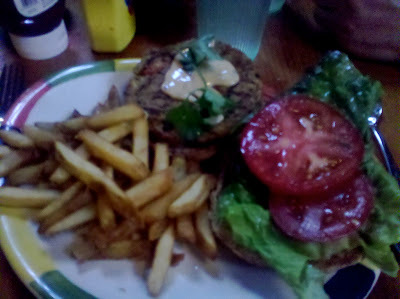 Instead, I have been eating Dr. Praeger's California Veggie Burgers, and I find them delightful. The reason they're awesome is because they don't try to be beef. When you bite into one, you experience exactly what it is: vegetables all packed together. Sure, it's in the shape of a burger, but it embraces its veggie identity rather than weirdly striving to be meat like some other foods - ahem, Gardein™. My parents were visiting this past week, and we drove up to San Luis Obispo for dinner one evening. (We came up with this plan without consulting Google Maps; when we got on the freeway and discovered that San Luis Obispo was about 95 miles north, we were already committed to the plan and had to continue.) While we wandered around a slightly-more-bizarre-than-expected pawn shop, I used the Yelp.com app on my phone to search for vegan restaurants in San Luis Obispo. I settled on Big Sky Cafe, which I had written about when I worked as a travel writer for Let's Go Publications. In the summer of 2008, after I graduated from college, Let's Go sent me up the west coast of the country from San Diego to Seattle, writing about restaurants/hotels/attractions. Most of the restaurants I checked out have kind of blurred together in my mind, but I remembered Big Sky Cafe as soon as we walked in. It tasted pretty good! Much better than a Boca Burger and almost as delicious as a Dr. Praeger California Veggie Burger. The only problem with Big Sky Cafe is that it's in San Luis Obispo and not Santa Barbara. But it was heartening to discover that I can successfully maintain my veghan-hood even while traveling around to various cities on the California coast. I think I'm all set, as long as I keep eating food that casts a shadow. I'm totally a Poser level lacto-ovo-pesce-vegetarian. Because I still eat meat. Unfortunately I think Boca Burgers rate a 1. I've heard good things about Dr. Praeger's potato pancakes, so, okay, you've convinced me to give the veggie burgers a try (as soon as I get my freezer).